​The doctors at Ousley Vision Center provide comprehensive contact lens fittings for our patients with nearsightedness, farsightedness, astigmatism and presbyopia as well complicated fittings for conditions such as keratoconus and aphakia. We offer a full line of contact lenses to fit your visual needs and lifestyle. For patients who are sensitive to contact lens solutions or just don't have time for cleaning regimens, daily disposable lenses are great. For our patients who prefer to sleep in their lenses for extended periods of time, the new extended wear lenses can be worn safely for up to 30 nights. If you prefer to have fresh new lenses through out the year, disposable or frequent replacement lenses may be right for you. We have many brand names available . Disposable lenses are replaced every two to four weeks. The frequent replacement lenses need to be replaced from one to three months. 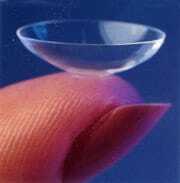 Toric contact lenses are designed to correct astigmatism. There are many options available for our astigmatic patients. Daily disposable toric lenses are now available, as well several disposable and frequent replacement brands. Soft conventional toric lenses may be the best choice for some patients. All of us at some point in time may be facing the challenges of presbyopia. Current technology has given us several choices in multifocal contact lenses. Some patients prefer to have monovision correction for their presbyopia. With this type of fitting the patient wears a distance lens in one eye and a near lens in the other eye. ​We carry a full line of cosmetic contact lenses to choose from, whether you're looking for dramatic change or just a little extra sparkle. There are exciting new choices for natural looking color.